Identification: Gilbert (1964); Page and Burr (1991); Jenkins and Burkhead (1994); another commonly used name is Notropis cerasinus. Native Range: Upper and middle Roanoke (and adjacent tributaries of Meherrin River-Chowan River system), and New River drainage, Virginia and North Carolina (Page and Burr 1991). Table 1. States with nonindigenous occurrences, the earliest and latest observations in each state, and the tally and names of HUCs with observations†. Names and dates are hyperlinked to their relevant specimen records. The list of references for all nonindigenous occurrences of Luxilus cerasinus are found here. Means of Introduction: Probable bait bucket release in Virginia, possible bait bucket release (or a natural stream capture) in North Carolina. The earliest record for Virginia was from 1965 in the Jennings Creek system of the middle James River drainage (Jenkins and Burkhead 1994). Abbott et al. (1977) stated that the presence of this species in Holiday Creek (Appomattox drainage) probably resulted from a bait bucket release into Holiday Lake, a recreational impoundment. Status: Established in Virginia (in lower Barbours Creek, James drainage). Reported from North Carolina and from other areas of Virginia. Remarks: The earliest record from the Cape Fear drainage is from 1959 from the upper Haw system in Virginia; the earliest North Carolina Cape Fear records are from 1968 (Jenkins and Burkhead 1994). 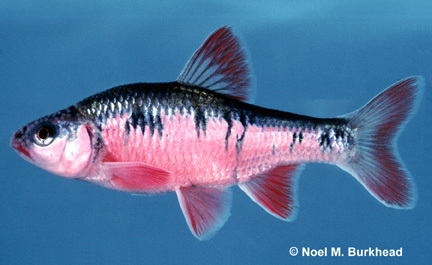 In their summary table of Virginia fishes, Jenkins and Burkhead (1994) listed this species as "regarded as introduced, possibly native" for the James River drainage (Atlantic Slope) and the New River drainage (Ohio River basin). Contrary to the opinions of several other authors (i.e., Page and Burr 1991; Jenkins and Burkhead 1994), Gilbert (1980) argued that cerasinus is not native to the New River system of Virginia. He noted that the species was first reported from that system about 40 years ago. Since that time this shiner has exhibited the rapid dispersal and expanded range so typical of other fishes introduced into the New system (Gilbert, personal communication).